A very disturbing email arrived from my vet. He reckons that if my cat is in a mood, it could be mimicking its owner. Firstly, that cats could be so astute and sensitive. Secondly, nowhere in the article did they mention the phrase ‘copycat’. Thirdly, my cat has been dead for six years. But putting those issues aside, I think it’s time you all cheered up, if not for your own mental health, but for the benefit of your cat. It could be too late for my cat, but we still have time to uplift your moggy mood. Research undertaken at Nottingham Trent University found similarities between behaviours exhibited by people and the behaviour of their cat. The report suggested a cat might absorb and then mirror certain personality traits from their human and there may be parallels with the parent-child relationship. 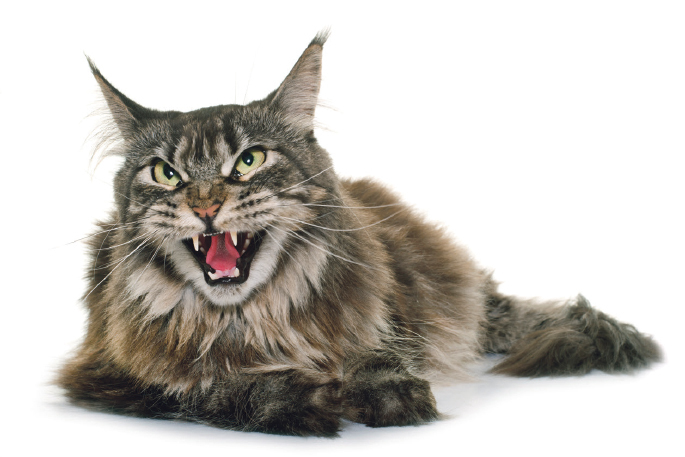 A more neurotic human personality was linked with cats with a “behavioural problem”. This might have been seen as aggression, anxiety or fear, or stress-related behaviours in the cat. Cat owners who were assessed as being more extroverted were more likely to have felines who enjoyed being outside. In other animal breaking news this week, Peppa Pig has been accused of sexism after an episode referred to a firefighter as a fireman. This cannot be tolerated - firefighters have enough to deal with and the last thing they need is people making assumptions about their gender identities. And if my cat was still alive, he’d be angry too. Meanwhile, Thames Coromandel District Council is getting serious about climate change. They’ve had meetings to talk about the consequences, such as sea levels rising and what the district can do to help the planet. Ironically, in the same week the same council enthusiastically promoted an event encouraging hundreds of gas guzzling, big old American cars to lumber around the peninsula in a fossil fuel frenzied festival. Now I’m not dissing either the climate science or the iconic Beach Hop, although it could be said both are gatherings of people living out their pet fantasies. But TCDC appears quite hypocritical. If you’re going to “take action on climate change” and “help mitigate the drivers of climate change” as the council states, they should probably have started last weekend. There were hundreds of drivers of climate change, driving all over the place, proudly demonstrating some of the most fuel inefficient, greenhouse gas-belching behemoths ever produced. That all sounds awfully noble, but there didn’t appear to be any electric cars amongst the thumping old V8s touring the Coromandel in the council-promoted Beach Hop. This council meeting sounds like another pointless climate talkfest to me, and it’s a fair guess most of them drove there (if I’m wrong, please send photo of councillors on bicycles). And speaking of ineffective action, how devastating was it for the homeless folk who were this week banned from within five metres of shops and businesses? Well, they all slept through it, and are still snoozing under the verandah as we speak. You really showed ’em, Tauranga City! As is the case with so many rules and regulations, they’re only as good as the policing to enforce them. The shopkeepers will be looking forward to actually seeing some action on this, not toothless regulation. It’s a similar story with the government’s attempts to get unlawful guns handed in. Are the gangs taking any notice? You have to be a special kind of naïve to believe any criminal is going to hand over illegal arms, just because you asked. Or that banning a whole bunch of guns isn’t going to flood the black market … into the hands of the very people you’re trying to disarm. Another gang warning in the emails this week: The Menzies Clan is gathering, and it sounds like they have numbers. That spine-chilling news is enough to rattle the sporran of any mere mortal lowlander. The Scots are planning a major invasion in 2020. A Gathering, in fact, that sounds ominous. “We are currently updating our mailing list to Clans folk and descendants of the clan for the 20th year Anniversary Gathering, 17-19 April 2020,” says Dennis Menzie. You have been warned, people. Last time we witnessed Scots amassing in numbers to celebrate, it resulted in some McLaren Falls. Quite of lot of them. Finally, daylight saving ends this weekend. Some people will be turning their clocks back an hour. Don’t worry about the finer details of forward or back … just do something with the clock. You have a 50-50 chance of getting it right, and at least you’ll look clever. This doesn’t affect the cynical folk amongst us, who never bothered to turn clocks forward at the start of the silly summer season. Or for those of us who can never figure out how to change the clock in the car, so have been either an hour late everywhere all summer, or become expert mathematicians while driving. Okay, so maybe adding one isn’t all that expert. Really appreciative motorists may give you two fingers or even a fistful of thanks. And bonus! That could lead to a re-arrangement of your living daylights. Have fun out there, be nice to each other and take care on the road.